In 1970, at the end of August, the Yankees announced that Mickey Mantle was returning to the team as a coach. It was a peculiar situation: the Yankees essentially platooned First Base coaches. Elston Howard would coach the first three innings, Mickey would coach the middle three, and then Elston would return for the final three. The Mick didn’t like the job, and he left after the 1970 season – never to appear in a uniform for a MLB game again. 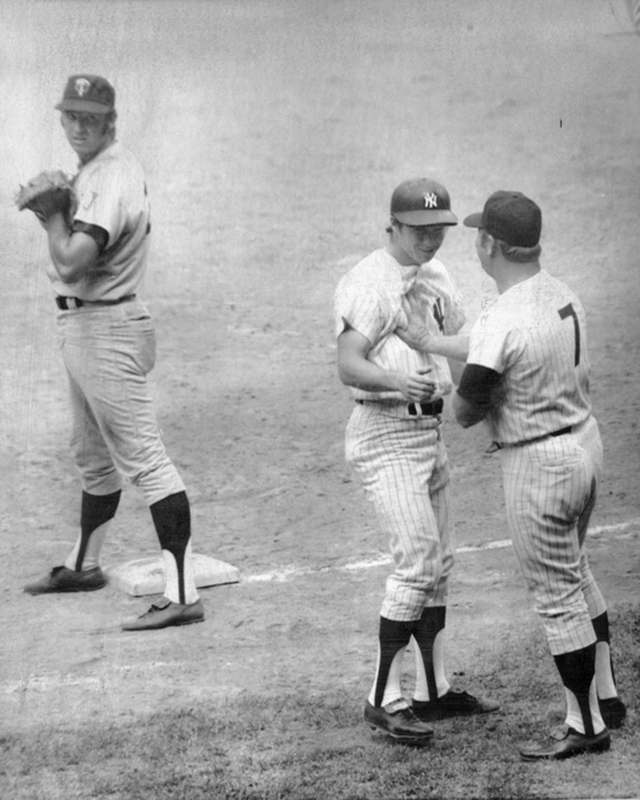 The Mick’s first game as a coach was on August 30, 1970 at Yankee Stadium. We were playing the Minnesota Twins and Bert Blyleven was pitching. Bobby Murcer led off the bottom of the fourth with a walk. When he got to first, he walked over to talk to The Mick, who jokingly pushed him away. All the Yankees got a real laugh watching that. Lemon stopped laughing seconds later when he was thrown out at second when Danny Cater hit into a double play. The Yankees won 5-2 on a well-pitched game by Steve Kline, and The Mick was, for a day anyhow, a good luck charm. And for those of you who are wondering, the Twins First Baseman in the photo is Rich Reese.